Worcester Wolves have signed American guard Josh Cameron, filling the gap in their roster left by Malik Smith. 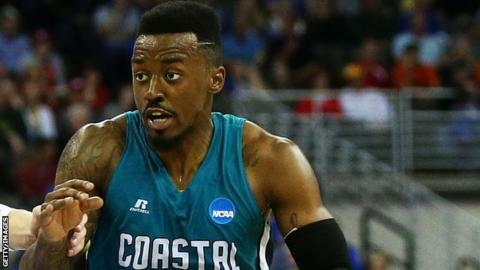 Cameron, 23, played college basketball for Costal Carolina helping them to two titles and has been watched by a number of NBA scouts. "This is an interesting opportunity to play in England. It's one I'm looking forward to," said Cameron. "I have heard about the club's ambitions and really want to be able to make an impact on the court." Wolves have been searching for a replacement for Smith for several weeks after releasing the American from his contract at the University Arena. Head coach Paul James has been waiting for Cameron, who averages 37% from the three-point line, to receive the necessary paperwork to complete his move and is now delighted he has finally arrived. "I'm looking forward to Josh joining the team," said James. "He will be coming in at a time where the team are really starting to play well together, which should make his transition smoother. "There are many areas of the game that we need to improve on, one of them is our three-point shooting and Josh will help strengthen us in this area." Wolves are currently third in the BBL table having won five of their six games so far, with Cameron set for his debut in Sunday's trip to Sheffield.